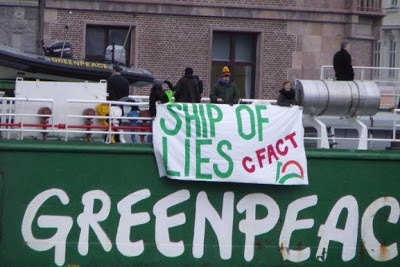 Greenpeace ships targeted, proper banners displayed! Well, we’ve all seen the massive turn in public opinion against environmental groups over the last few years, and now people are using Greenpeace-style tactics to get their message across. 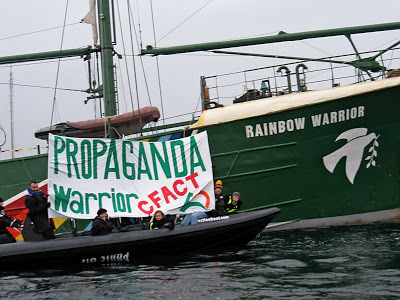 The wonderful folks at CFACT and Marc Morano’s Climate Depot intercepted the infamous Greenpeace vessel, Rainbow Warrior. They then proceeded to unfurl a banner reading “Propaganda Warrior”. We tip our hat to CFACT! I love this website!!!! It is ironic that the tiny, ridiculed molecule, CO2 is what makes this planet, GREEN!!!!!! Even more ironic is that petroleum is actually pressure-cooked plankton and other such tiny GREEN life forms! I love CO2 also!!! The banners need to be much larger……but I'm happy people are fighting back. Ray, lmao. Love the "sea going dickheads" label. I only wish they had gone the distance…… I have watched videos of these clowns attempting to disable ocean going vessels while at sea in the north pacific….. with ice in the water…. I have seen them ram other vessels in the same waters…. i would have loved to see them attach cable to the underside of the ship so that when they got underway at speed the cable would rise upwards and become entangled in their screw rendering THEM disabled and adrift in the open ocean!!!!!! Awesome! But I'm not clear on why the same guys who put it up, also took it down. I think it should have remained there. Permanently. I don't think Greenpeace will take very well to tables being turned on them!